Lilly is a rescue dog from Albery Dog Rescue; she came to us when she was only 18 months old. 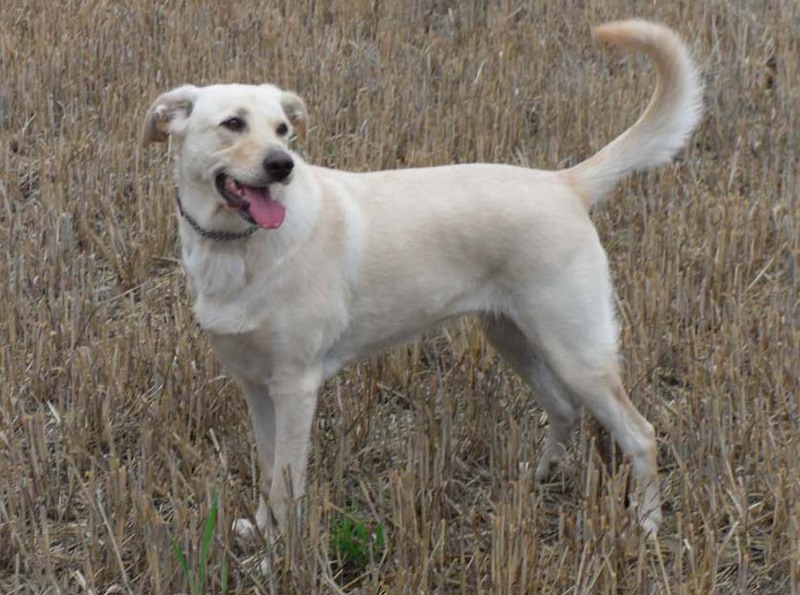 Allegedly an Alsatian cross Labrador but who can be sure! She is blonde in summer and a light brown colour during winter. 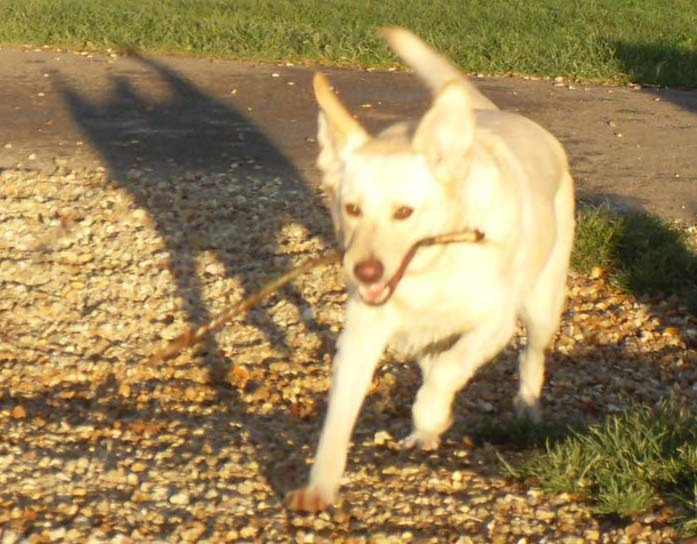 A slender 34kg of boundless energy obsessed with retrieving balls thrown for her. In the event a ball is not available a stick will do just fine. Her daily routine involves waking up, stretching and yawning and then staring at us till we give in and go for a walk. Then for as long as possible have the ball thrown to chase and hide from Bunk. The only break from this obsession would be for a morning call of nature or the scent of a rabbit that can cause a period of running and sniffing. A quick game of tug-of-war with Bunk, with a rope, and then off back to home and a morning kip (preferably on the double bed upstairs). First though, a pleased look at all the muddy pawprint patterns she has made on the kitchen floor. When afternoon is fully developed repeat morning routine to get the 2nd walk of the day. 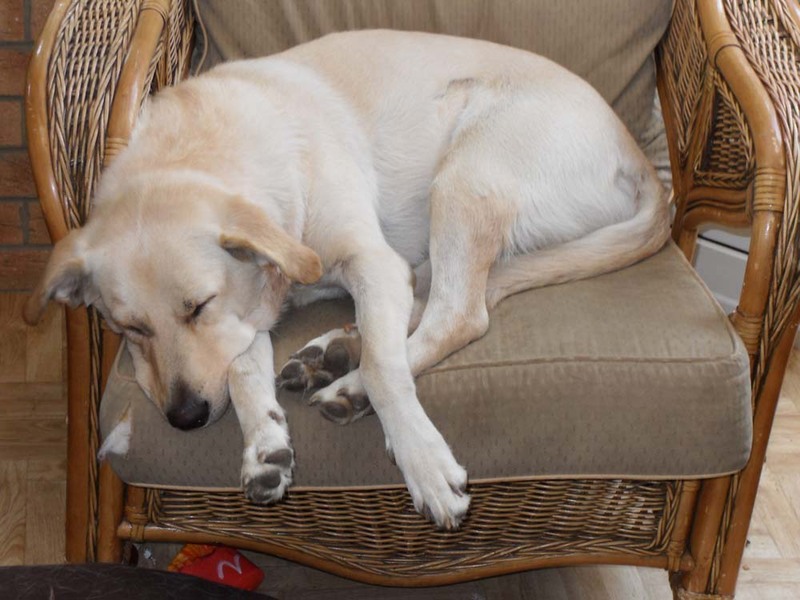 Then retiring to her personal sun lounge chair, or “Lilly Throne” as we call it, another kip. Awaking for dinner around 7pm and a drink, before walking all the way to the front room to crash in front of the TV for the evening kip. Signs of life will be observed should anyone in the street so much as think about using their front door, or for goodness sake their car. Around 10 o’clock she may venture back upstairs for another kip on the bed, but this is purely so she can warm the bed up for us, in no way is it because she has decided it’s the most comfortable place to sleep in the house, absolutely not! Finally when we retire for the night and kick her off our bed she begrudgingly walks to the guest room to “warm” their bed up. A truly beautiful dog. They generally have wonderful natures and are very patient with children, I have found. Thank you. She is The Best!